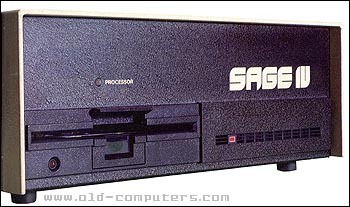 The Sage IV was a no-compromise extended version of the Sage II. There were 2 large PC boards in a SAGE IV. The first had the CPU, 2 serial ports, PIO, GPIB, floppy controller, up to 512K DRAM. This board was the same as the main board in the SAGE II. The second board (which set above the first) had 4 more serial ports, hard disk controller, and another 512K DRAM. The case was slightly taller as it contained the full height hard disk. The built-in multi-user BIOS, written by Bill Bonham the Sage software guru, allowed the Sage to run several operating systems at once, serving up to 6 serial ports in real time within 1 MB of RAM... in 1983. At this time, PC/Intel based systems used a 8 bit-bus processor running twice slower, and a primitive operating system. So why this Sage system didn't become the standard of the future? In addition to the P-System delivered with the system, several companies in the world wrote various operating systems (CP/M, Posix, PDos, Tripos, Pluto...) and languages (Fortran, Lisp, Pascal...) for the Sage IV. Although Sage systems were the fastest personal systems of their days, and were intensively used by scientists and engineers for more than ten years, they are now totally forgotten, and so are all their powerful related OS's and software. Our lab had the Sage II and IV. This company changed its name to Stride Computer and continued operations under that name for a while. There were more models produced under the Stride name with the same basic architecture - P-system O/S, Motorola processor, dumb terminals. Our lab also had at least two Stride machines. Of course now they are long gone. I worked for a company that sold stride computers in Sweden, Norway and Denmark, and I think, there was nothing more stable in the micro computer range at the time. In Denmark they controlled wind craft generators and was running over 10 years with zero admin, and maybe even zero reboot. I was one of very few in Sweden that could operate them and partition the hard-drive for unix (UniStride) for the Stride 440, 460. I also repaired the 400,600 series, so Stride Computers sent me all drawings and pal source. Later they came with SCSI, and the need for PSYS was removed. (stride 640 ,660). The last model in the serie was Stride 740 also sold as SuperStride 740 and Shannon 5000. (I even think they was named Millenium a short period). The 740 model had 48 serial ports, and could easy handle all of them at the same time with 20-30 Office users logged in, a room full of printers that run constantly and so on. One company in Sweden still use one superstride 740 in production, and I support it for them. My first unix machine was a stride 440 , so it's very nostalgic things for me. see more Sage Computer Technology Sage IV Ebay auctions !